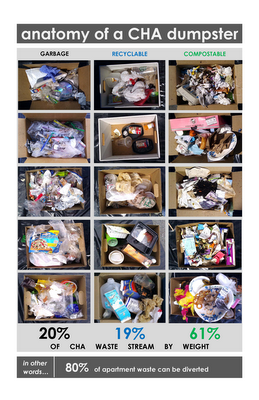 Over the past few weeks, the sustainability staff has carried out a waste audit to determine how much of the waste from campus apartments could in the future be diverted away from landfills. While rifling through garbage wasn’t exactly pleasant, the results found were pretty staggering: over the course of the audit, a full 80% of waste from campus apartments was material that could either be recycled or composted. That means only 20% of the garbage was actually waste! The data from the audit will be used to better inform SPU’s waste policies and encourage the promotion of composting options in campus apartments. The University is planning on establishing a composting program for campus apartments in the fall. Categories: Environment | Tags: Compost, Conservation, Food, plastic, Recycling, Waste | Permalink.